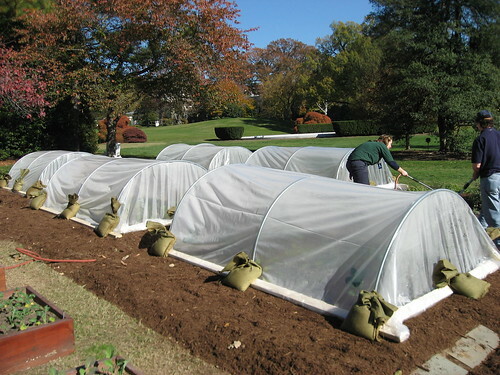 Completed hoop houses at the White House Garden. What are those giant clear caterpillar looking things in the White House garden? They are high tunnels and they are another step in increasing the ability of farmers and gardeners around the nation to grow and provide healthy nutritious fruits and vegetables throughout the year. Quite simply, they capture solar energy and create favorable conditions enabling farmers to grow vegetables, berries and other specialty crops in climates and at times of the year in which it would otherwise be impossible. You may remember the high tunnels that went up around this time last year and the sensational video we posted on YouTube then. 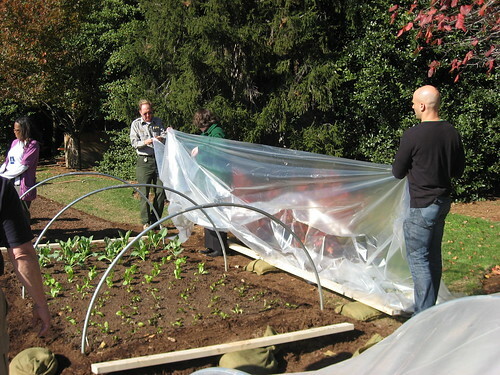 High Tunnels are often made of plastic or metal pipe and covered with plastic or other sheeting. Easy to build, maintain and move, they provide an energy-efficient way to extend the growing season. Unlike greenhouses, they require no energy, relying on natural sunlight to modify the climate inside to create favorable conditions for growing vegetables and other specialty crops. I had the opportunity to join White House Assistant Chef Sam Kass recently to help assemble the high tunnels in First lady Michelle Obama’s garden. While the weather in the Washington D.C. has been fairly mild, it will soon turn cold and long after the first frosts, the White House will be enjoying fresh greens right from their garden. Families across the nation can use simple ideas like this to increase the number of fruits and vegetables they consume. In turn this will lead to healthier families, a key component of the Let’s Move! campaign. Small changes like this can make a big difference and add up to real results. But the benefits of high tunnels go beyond the home garden. Farmers across the nation are working with the USDA’s Natural Resources Conservation Service (NRCS) as part of a three-year trial to determine their effectiveness in conserving water, reducing pesticide use, maintaining vital soil nutrients, and increasing crop yields. This is a win-win situation for everyone as farmers who sell their high tunnel produce locally benefit from the extra income, and the community benefits from the availability of fresh, locally grown food. These are not high-tunnels. lol They are low-tunnels. High-tunnels give you height enough to walk under. They can best be explained as unheated green-houses. Soil prep, planting and harvest take place with the plastic in place. Most high-tunnels are permanent structures. The 72'x30' high-tunnel we erected, allowed us to drive a tractor in it... in fact, we were able to turn the tractor and disk around, w/o leaving the structure.